The SQL Power Suite is the most robust and compelling financial regulatory platform for Securities and Exchange Commissions in the world, delivering the ultimate in flexibility, efficiency and transparency; increasing the likelihood of timely successful intervention while providing all interested parties with the ultimate confidence in the regulated market! Expertly designed for securities and exchange commissions across the globe, SQL Power offers market regulatory solutions that can be easily tailored for a given jurisdiction’s needs while also providing a robust platform that can easily evolve with your organization’s needs and widely accepted market regulation and compliance standards without needing to make any additional software purchases – Thus future-proofing your organization’s market regulation platform. Our software solutions are architected to integrate easily with existing securities and exchange commissions software and infrastructure for a seamless transition and for easy on-boarding of all market participants. Our solution is dynamic, flexible and scalable and can be easily configured to automate all your current registration, licensing, and financial data collection needs thereby providing market participants with a web portal and on-line forms to prepare and submit their registrations, license applications, and financial returns. The system financial reports based on publicly available standard taxonomies like IFRS accepts or US GAAP (or a variation of either). The system also offers the market participant with the flexibility to extend the filing and to report additional information that may not be strictly required in the standard financial report template. The SQL Power solution also comes bundled with integrated Analytics which instantly highlights key metrics and their relative performance on any financial submission. Analysts no longer have to remember or look-up acceptable key risk ratios or an organization’s reported metrics from the last reporting period or its relative performance to its peer group. Our financial reporting platform allows each commission to define their key performance indicators (KPIs) for all market participants, acceptable ranges for each metric, or the acceptable variance year over year. 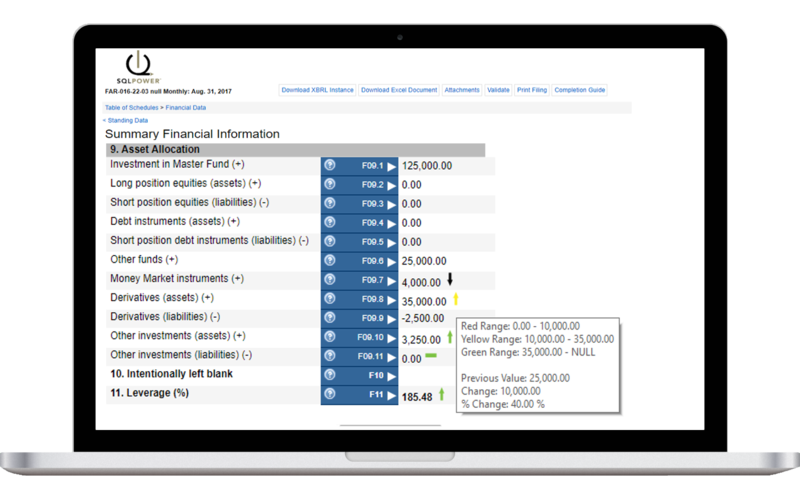 Once the financial returns are submitted, the system immediately highlights and colour-codes (red, yellow or green) each submitted KPI, providing a colour-coded up or down arrow, while also allowing the analyst to hover over the submitted metric to view a pop up of a trending graph and a year-over-year performance comparison chart. Increased Automation, Improved Efficiencies while Future-Proofing your Market Regulation platform! SQL Power uses its powerful and robust data collection and analytics platform to automate the core market regulatory processes from registration to licensing to financial data collection, document management, and processing, paving the way for more efficient use of personnel resources. Through a fusion of pre-built industry standard forms, customized workflows, electronic signature, payment collection, and integrated analytics functions, SQL Power immensely reduces all the manual effort typically associated with market regulation and ongoing market risk assessment. No more eye-balling of financial returns or manually looking-up key risk ratios or year-over-year performance of a listed company or its peer group to identify risk exposure; in seconds the system highlights problematic financial submissions amongst the sea of green (acceptable) submissions, allowing the analysts to focus on the problematic financial returns. Once the problematic financial return/submission is opened, each key metric is colour-coded and any violated risk ratios are instantly highlighted significantly cutting down on the manual review process and the market division’s workload. SQL Power’s market regulation/SEC solution is designed to easily integrate with existing core CRM and governance systems, leveraging existing data and technology investments for a seamless integration. Our platform can be configured to easily evolve with global market regulation and compliance standards thus future-proofing your organization. Finally, our experienced team of engineers work within your business scale to ensure that our software implementation is smooth and functionally sound. If your organization could benefit from SQL Power’s advanced market regulation solutions, we’d love to hear from you!